1 For the chicken, rinse the herbs and gently pat dry, then finely chop the leaves. Mix the mustard with egg yolk, oil, breadcrumbs and herbs. Season with salt and pepper. Season the chicken breasts lightly and coat with the herb mixture. 2 Place the chicken breasts on a baking sheet lined with aluminum foil. Bake in a preheated oven at 220°C (approximately 425°F/ gas mark 3-4 / convection 190°C or 375°F) for 15-20 minutes. Remove and keep warm. 3 Melt the butter and skim off the white foam. Grate the lime zest and squeeze the juice. Combine the lime juice, white wine and egg yolks in a bowl. Set the bowl on a hot water bath and heat the mixture while stirring. Gradually beat the butter into the mixture, adding in a thin stream. Add the lime zest and season with salt and pepper. 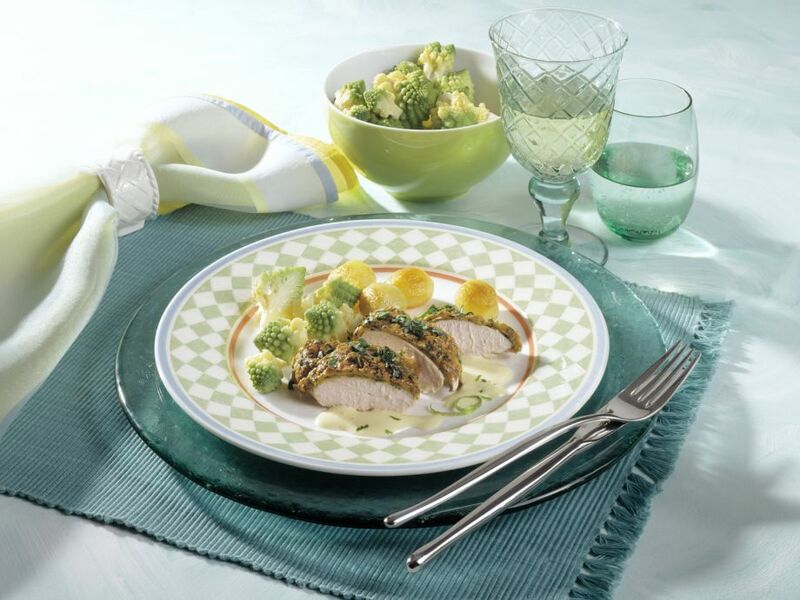 4 Slice the chicken breast, arrange on plates with vegetables as desired and drizzle with the lime hollandaise.